I have a wonderful book to share with you today - perfect for gift giving. This one would be great for that new mom or even a mom who has older teens (like me!) I see my oldest children growing so fast and I know I have to embrace each day and create meaningful memories. I want them to look back and know Mom & Dad loved them by showing them a full life. 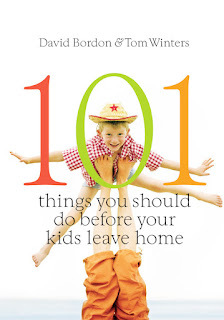 101 Things You Should Do Before Your Kids Leave Home by David Bordon & Tom Winters is just the type of book to give you great ideas. This book is a mix of helpful things you should teach your kids like laundry and the art of writing thank you notes as well as fun ideas like hot air balloon rides and having a family talent show. 101 ideas is a lot of suggestions which is awesome because you can tackle them over the years rather all at once. Each suggestion comes with a full page explaining the idea and some thoughts on it - it truly makes for a wonderful read. There were many ideas I just didn't think of and we've already started on tackling some of them. Ever wished you could keep your kids away from the TV for an hour, let alone a full day? For anyone looking to make fun, lifelong memories with their family comes 101 THINGS YOU SHOULD DO BEFORE YOUR KIDS LEAVE HOME. Seasoned parents know that the days are long, but the time is short. It can be tough to come up with ways to make lasting memories, but now you don't have to! David Bordon and Tom Winters have collected 101 original ideas to inspire parents with kids of all ages to step out of their daily routine and spend precious time together as a family. From creative concepts such as opening a snow cone stand to service projects like volunteering in a soup kitchen, some suggestions are fun, some challenging, and others practical--but every page is jam-packed with advice designed to help parents prepare their children for life out in the world, while making sure that every moment counts. You can purchase your copy at your local book retailer or online at stores like Amazon.